Continue with the current pasture allocation to achieve a grazing rotation of 35 days. This requires one paddock per week from each farmlet to be grazed for 48 hours so paddock order for grazing takes this into account. In the Std. Kale it is essential this round length is strictly followed to prevent eating into cover and further reducing the feed wedge balance. Supplement will be fed to the Std. Kale this week in the 48-hour grazed paddock. Three bales of baleage will be fed (equivalent to 2kg DM/cow/day) and residuals in the 36 hour grazed paddocks will be assessed to determine if baleage also needs to be fed to achieve targeted DM intake. Unlike the Std. 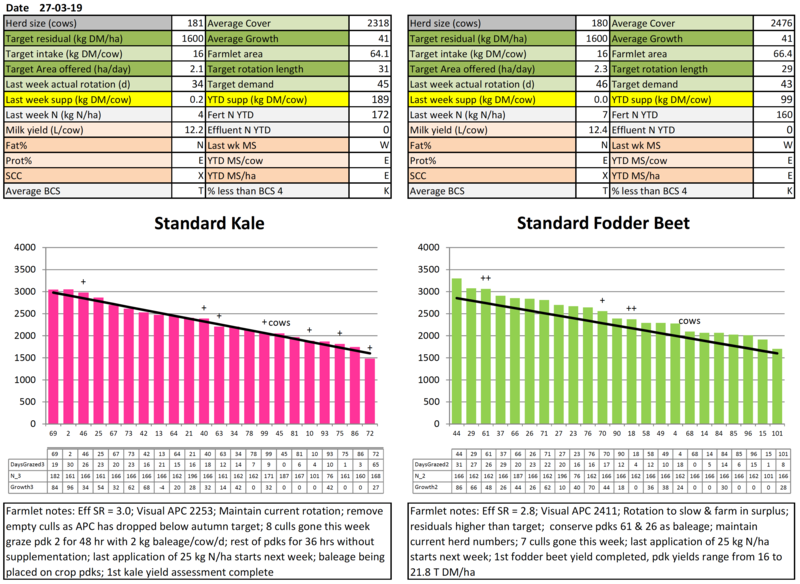 Kale farmlet which is running below target on the feed wedge, two farmlets – x2 (Std. FB) and x1 (Std. Kale) paddocks will be stepped over for conservation. The final application of N (25 kg N/ha) will be made on the Std farmlets over the next 15 days. Soil temperatures must be above 7 °C and we will not apply N after mid April as outlined in our decision rules. After the Farm Reference Group meeting last week it has been decided that the target APC at the 1st June be lifted for the LI farmlets from 2000kg DM/ha to 2100kg DM/ha. This was decided as we are unsure of the growth pattern through spring in these lower N farmlets. More options are available to deal with surplus pasture in spring than not enough during this period. The autumn feed budgets are being revised to reflect this change. 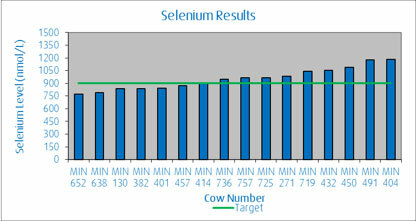 X20 culls left the farm this week consisting of x8 Std kale, x7 LI Kale, x5 Std FB and no LI FB. The decision has been made to try and cull the remaining x21 Std. Kale cows as soon as possible to decrease the feed demand on the farmlet. Crop yields have been completed on all the fodder beet and Kale paddocks. The confirmed FB yields, based on DM% from each paddock, have come through at a range of 10.5-21.8t DM, with an expected gain in yield of 3 t DM between now and the 1st June. The paddock at 10.5 t DM/ha is a 2nd year paddock very badly impacted by poor seedbed preparation and a resulting heavy weed burden. The highest paddock at 21.8 t DM/ha is a crop that followed kale last winter. 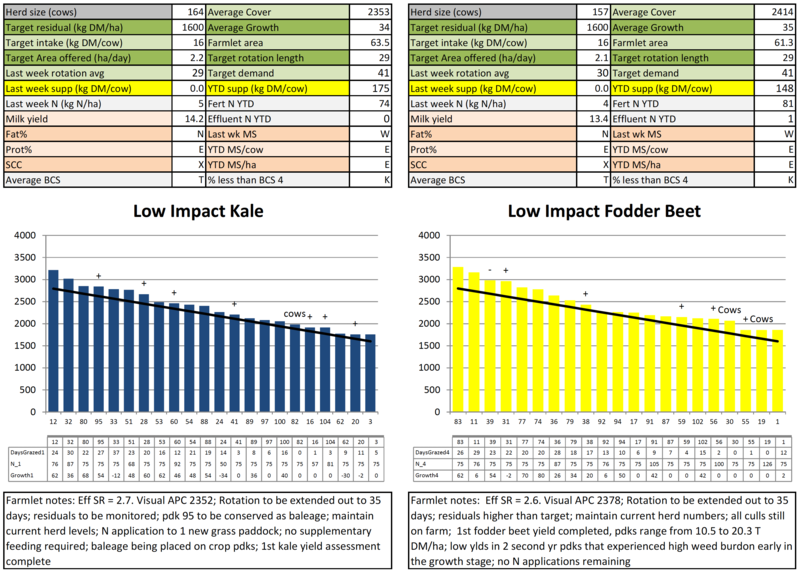 The Kale crop estimate yields, to be confirmed next week once the DM results are complete, have been estimated at a range of 7.2-11.2 t DM/ha on the milking platform, based on 10%DM (the average from last year). From walking through the crop, compared with last year, the Kale has taken a better strike with 2-3 times more plants per square meter. However, although there are more plants, they are thinner compared to the thicker stems last season. Crop yields will be completed from approximately the same areas in the paddocks in April and May. 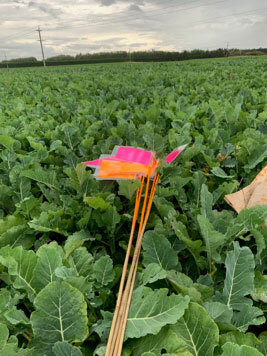 To allow this to occur flags are being used to mark the areas in the kale paddocks (see below). Full SDRF board meeting on farm including a shared lunch with the farm and tech teams. The last of the botanical compositions were completed this week. Over the last 4 weeks the tech team have been collecting pasture snip samples (cut to ground level) to determine the species composition in each paddock. Results in the table below show that the LI farmlet paddocks, on average, contain less ryegrass and more clover. Differences in the % dead, other grass and weeds is less between the Std and LI farmlets. 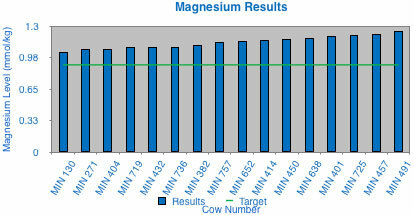 The relatively high dead content reflects that the pastures were sampled to ground level. Very little of this dead material was present in the grazing horizon.